Constrochem India is the manufacturer of synthetic based foaming agent concentrate, used to make the light concrete or foam concrete. First it is to diluted in water and then foam is produced in a concrete foam generator with compressed air. It is known as Foam Guard. 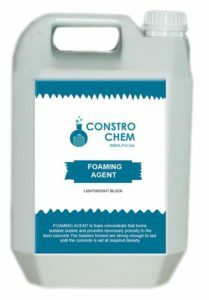 Constrochem India is the manufacturer of synthetic based foaming agent concentrate, used to make the light concrete or foam concrete. First it is to diluted in water and then foam is produced in a concrete foam generator with compressed air. Foam produced has very fine and stable high quality foam. Stability and density depend on dilution & settings of the foam generator. Our synthetic based foaming agent gives high stability of the foam, successfully with standing the conditions when mixing, conveying (pump-able), pouring, casting and during the setting and hydration process. The foam causes no chemical reaction in the concrete but it acts as a binding for the air entrapped. For PPC Cement % of cement content will be more. Physical appearance: Light Yellow Translucent liquid. Dosage may vary depending upon mix design, process, aggregate type and the desired effect, however typically 1liter of Foam Guard per 25-30liter of water, with help of the foam generating equipment low density concrete can be achieved, when foam generating equipment is used, prepare solution of 1 liter Foam Guard in 25-30 ltr of water, depending on type of foam generator. 50-60 gm foam density can be achieved. It shows best result in CLC Bricks. In case of hard water, a higher dosage maybe required. 12 months from date of manufacturing if stored properly in undamaged unopened, original sealed packaging, in dry conditions. Protect from direct sunlight and frost. Normal care should be taken as it is non hazardous product.